Doing the right thing ain’t cheap…not when you’ve got to pay the devil’s due. After a lab explosion leaves him changed forever, wanted fugitive Jack Stratton knows only one thing for certain; he’s just one wrong move away from a fate worse than death. Struggling to make sense of life on the run, Jack assumes that middle-of-nowhere, Iowa would be the safest place to lay low. But small towns can hide big secrets. When a free drink and a misguided act of chivalry blows the town’s sleepy veneer straight to hell, Jack is left to deal with the mess. Blackmailed into criminal service by a backwoods gangster with delusions of grandeur, Stratton finds himself faced with the ultimate choice…save the town or save his own skin. Can Jack use his otherworldly powers to rescue the town’s beautiful bar owner and bring the small town mob to their knees? Or will a pair of ambitious federal agents find him before he has the chance? The Devils Due is a heart-pounding new thriller. 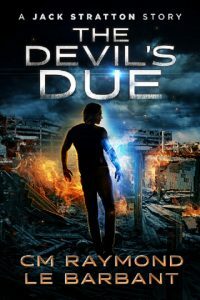 If you like edge of your seat thrills, harrowing suspense, and nonstop action then you will love this new installment from CM Raymond and LE Barbant—The Devils Due! Note: The Devil’s Due is a novella with 34,000 words (approx. 115 pages) of action. C.M. Raymond holds a PhD in philosophy, which qualifies him to write action stories but not much else. His home is in a river valley of Western Pennsylvania. Outside of reading and writing, he loves to spend time with his family in the woods and wilds or the city streets. Before writing The Steel City Heroes trilogy and The Jack Stratton Stories, C.M. penned a middle grade/teen serialized fiction series called Arcanum Island, first for his sweet daughter, then for the general public. It’s fast, fun, and full of adventure. Though written with kids in mind, many adults have also been taken by the mystery.